Garage floor mats are designed to protect the surface of your garage floor. As an added bonus, they contain spills, which protects your walls and objects stored on the floor. To get the best garage floor mat for your specific needs, make sure that the mat you buy is plenty wide enough to park your vehicle on it. This isn’t a problem with small cars, but trucks and SUVs need a wider surface. 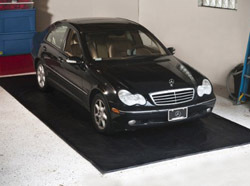 This AFG premium containment mat may be the last floor mat you will buy for your garage. Its largest size is wider (measuring 8.6′ x 20′) than other leading floor protectors, and has raised edges to help you keep the water and mud which falls from your vehicle off the floor of your garage. The raised edges are filled with a soft foam padding that will compress when you step or drive over them. This reduces the possibility of tripping, but you’ll have to be careful not to give water an avenue for draining off the containment mat. One way to do that is to simply put towels under the edge to provide slightly more lift. You could do the same thing with small diameter wooden rods or dowels, but keep in mind that doing so increases the risk of tripping, and watch your step. But to be honest, it really isn’t necessary to make this change and 99% of individuals won’t have any issues with water containment. The added width is perfect if you own a pickup or SUV, because other mats of this type are designed for smaller, passenger vehicles and may not fit wider ones. 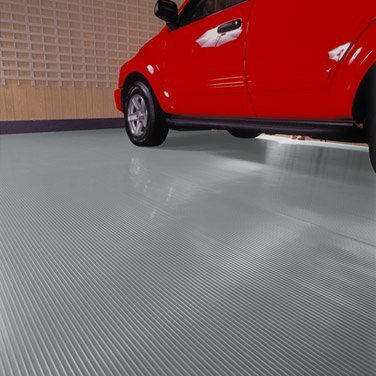 The most common complaint with the Auto Floor Guard is that the thin material has a tendency to slip or bunch if you turn the wheels or even shuffle your feet near the edges. Unless you have the ability to clean the containment mat where it sits, there is not much you can do to correct this minor design flaw. Cleaning in place is not difficult, though, and can be done with a shop vacuum, or a mop and push broom. If you’re going to clean the mat in place, you can make it stay in place better by putting strips of double sided tape on the underside, running across the width of the mat. Use a strip every 18 to 24 inches, and the mat will not “crawl” when you drive over it or even if you drag a lightweight item. When taking the mat outside to clean it, you will have to be careful not to scratch or puncture the containment surface. It is made from heavy material, but will still tear easier than a similar sized-tarp. Overall, Auto Floor Guard mat is not super fancy but just works really well. This made in the USA garage floor mat comes in various sizes and colors and is an excellent option. If your garage floor rises away from the opening, as many are constructed to do, it will also be easy to sweep or mop clean. The ribbed surface channels water, which works as well as having a garage mat with raised edges. With sizes starting at 5×10 all the way to 10×24, you’re not stuck in a one-size-fits-all approach so you can fit anything from a motorcycle to Ford F350 on it. The mat comes on a roll that makes it easy to transport, but being rolled on the spool for a long period is also the biggest single complaint. For the best results, unroll it facedown on the driveway, or your lawn for several hours of exposure to direct sunlight. The heat will gradually make the material more flexible so that the mat will lie flat when installed. Since the edges aren’t very raised, you’ll want to use some sort of parking aid to get you centered on the mat. Of course if you drive a Mini Cooper or Fiat 500, you probably won’t have to worry about that. Like the AFG mat, this one has a tendency to bunch up if you turn your wheels, but double-sided tape is an easy and inexpensive solution. Even with the ribbing, this mat can be very slippery when wet. There is not much you do to correct that, so be careful walking on it when you have brought the car in during a rain shower.